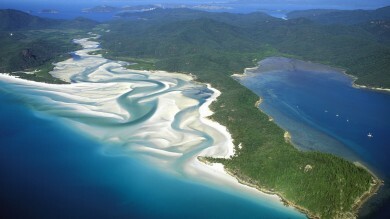 Fraser Island off Queensland's east coast is a perfect place for a day tour. Inscribed as a UNESCO World Heritage Site in 1992, Fraser Island lays claim to being the world’s largest sand island. Lying just off the eastern coast of Australia and situated just a few hours’ drive from the thriving city of Brisbane, to visit Fraser Island is to explore many of Australia’s most interesting habitats. From freshwater lakes to eucalyptus woodland, by way of mangrove swamp and barren sand dunes, the island boasts a whole wealth of sights. 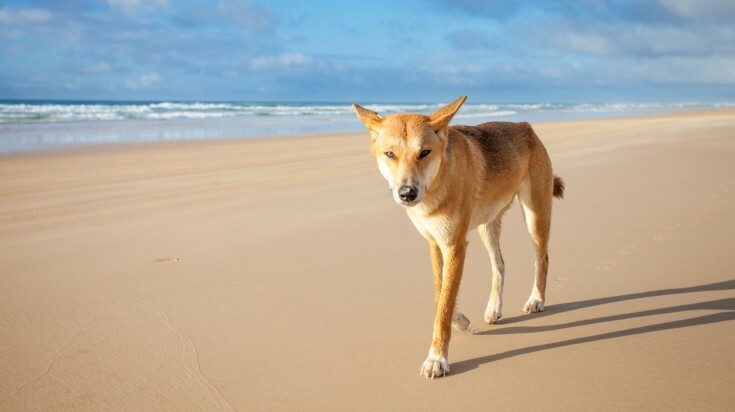 But the island is perhaps best known for the chance to drive the length of 75 Mile Beach, and for its population of dingoes - which is thought to be the last pure population of the animals in Eastern Australia. Location: Approximately 250 km (4 hours) north of Brisbane, near to Great Sandy National Park and the town of Maryborough. How to get there: Vehicle ferries depart from Urangan Boat Harbour in Hervey Bay, and from Rivers Head just outside the bay. A further ferry operates an on-demand service between Rainbow Beach and Inskip Point on the island. Comprising smooth, soft sand, 75 Mile Beach is a spine running along the eastern side of the island. The main highway on this side of the island, it has attracted fans of off-road driving for years. With the clear waters of the Coral Sea to one side and ancient forest on the other, 75 Mile Beach doubles as a landing strip for light aircraft (so keep an eye out!) and part of the hunting ground for the island’s famed pure bred dingoes, of which there survives a small population of around 200 individual animals. 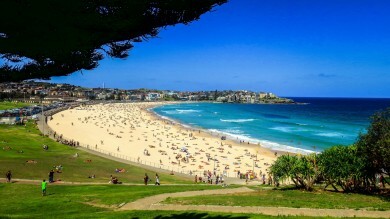 One of the best coastal drives in the world, and one of Australia’s most iconic, it is dotted with points of interest, including the wreck of the SS Maheno, and the Champagne Pools natural spa. Check out this day tour on Fraser Island and drive through 75 Mile beach. 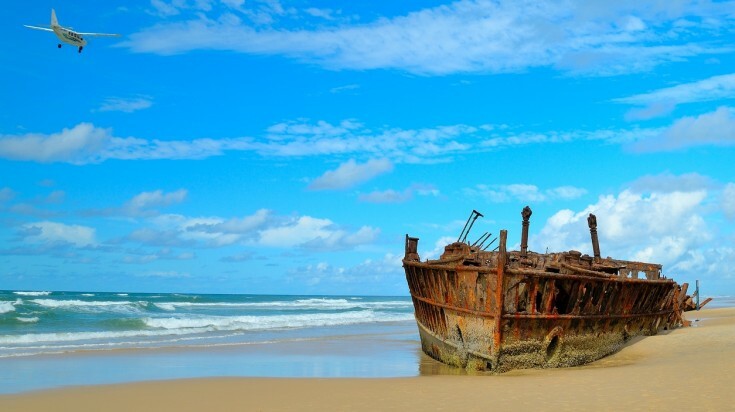 The most famous of Fraser Island’s twenty-plus shipwrecks, the SS Maheno became beached on 75 Mile Beach while it was being towed to Japan for scrap in 1935, forcing her skeleton crew of eight to camp on the beach for several days before rescue. Though the wreck was offered up for sale, there were no interested buyers, and the ship has remained on the beach ever since. The corroding metal structure has become an eerie, mesmerising tourist attraction in the intervening years, and has also entered aboriginal folklore with men coming to the site to play the didgeridoo and women even coming here to give birth! No Fraser Island day trip is complete without a visit to this beguiling eighty year old relic of another age. This 3-day tour is a great way to extend your Fraser Island day tour and enjoy more time on the island. 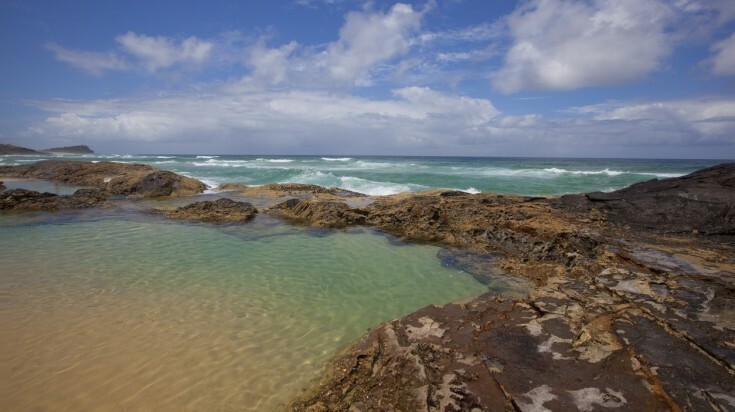 A frothy natural Jacuzzi formed by waves rolling into a series of volcanic rock pools leaving tingling Champagne-like bubbles as they withdraw, the Champagne Pools are just a short walk north of the Indian Head promontory in a stunning spot. The pools are reached via staggered wooden stairway and boardwalk, which provide the added bonus of some breath-taking views. For a quieter experience, the large, shallow and sandy-bottomed pools are best enjoyed at low tide, when the incoming waves are calmer. If on one of the many organized Fraser Island trips, ensure you opt for one which has time scheduled to visit the pools so you don’t miss out on this unique experience. Fraser Island has a reputation as one of the world’s best beach fishing sites, and even if you’ve never held a rod before there is no better place to learn than here. Serious anglers and sports fishers are equally well catered for, with popular fishing spots on 75 Mile Beach, Indian Head, Sandy Cape and Kingfisher Bay Jetty. Plus, whatever time of year you visit the island, you’ve the chance to bag yourself whiting, dart, and jewfish, which can weight up to 40 kilos when fully grown. Between August and October there’s also the chance to hook tailor fish (also called Bluefish) during the ‘tailor run’, which attracts hunters of this aggressive game fish from across the region. Should you prefer to gaze at the denizens of the deep rather than do battle with them with rod and line, Fraser Island remains the place for you. Protecting Hervey Bay from the anger of the open ocean, the island’s bulk has made its waters a haven for humpback whales during their annual migration. As tens of thousands of humpbacks make their way along Australia’s east coast each winter to escape the cold of the Antarctic waters, they shelter in Hervey Bay to raise their new born calves. The main population can be found in the bay between August and October, and while they can be sighted from high spots including Indian Head, nothing beats getting out on the water on a whale watching boat trip. Although it may not look like it, 75 Mile Beach is a gazetted highway, meaning normal road rules apply. Police keep an eye out for those who may have consumed alcohol before driving. Don’t do it! Dingoes may appear identical to domesticated dogs, but they are wild animals. To prevent them lashing out, keep your distance and stay ‘dingo safe’. 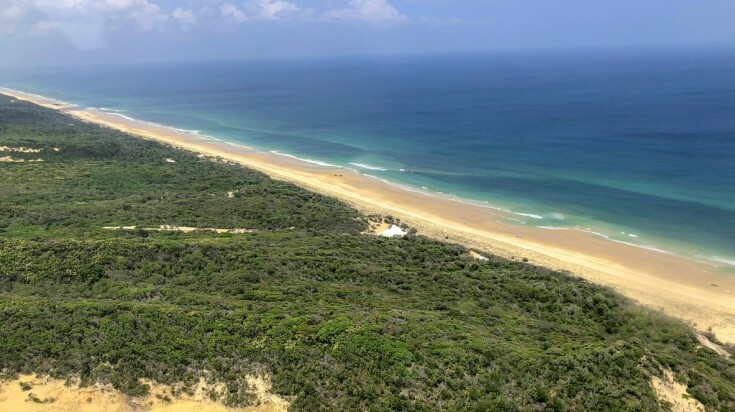 Away from the Champagne Pools, 75 Mile Beach is not recommended for swimming because of the large shark population and the strong rip tides along the Fraser Island coast. There is also no life guard service. 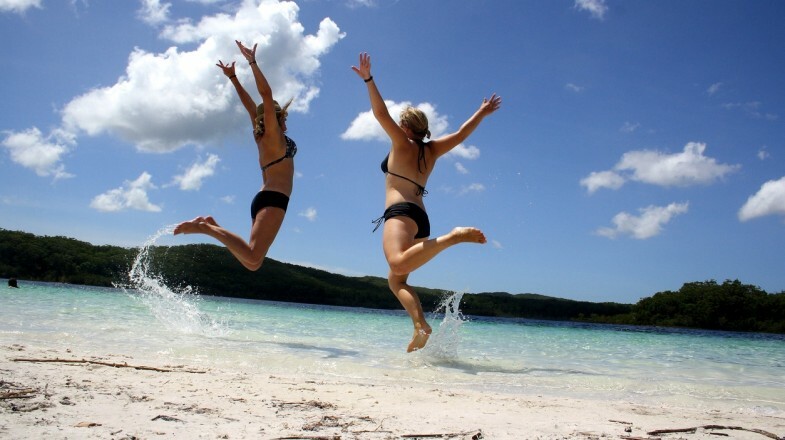 Don’t miss out on all Fraser Island has to offer. With such a varied landscape and phenomenal choice of things to do, you simply won’t regret taking a Fraser Island day trip.